This is a special, non-Wednesday post, but I simply couldn’t wait until next Wednesday to share it. Why? 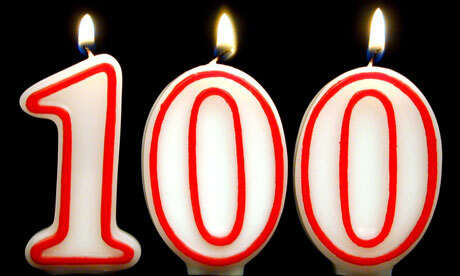 This is my one-hundredth blog post. To some bloggers, this might be small potatoes. There are people who blog daily, or even multiple times per day, with new ideas constantly shaping into thought-provoking posts. And then there’s me. So the sheer fact that I’ve reached this milestone is kind of awesome! On January 3, 2012, in some facet of a New Year’s Resolution attempt, I officially started the phase(two)learning blog, after chewing on the idea for a few months. I had no idea if I would ever find my “voice” or some cadence to my blogging habits. I also had no idea if anyone would even be listening. I really didn’t give it that much thought. All I knew was I had a few things to say about Onboarding, Learning & Development and Facilitation Skills, and I thought, maybe…just maybe…there would be a few other like-minded people out there who might appreciate it. We’ve arrived at one hundred posts. You’ve let me ramble. You’ve read some of my goofy stories. You’ve shaken your fists at Status Quo with me when I’ve dished out some tough love. You’ve accepted my weird, yet enduring love for Mr. Sketch markers, analogies and slang. But most of all, you’ve listened and shared your own thoughts. And for that, I thank you. A hundred times over. Because I’m feeling sentimental, I have a gift for you. This eBook is a compilation of 7 popular phase(two)learning blog posts, all directed toward the unique needs of Hiring Managers during the Onboarding process. In addition to the written content, there are a number of additional reflection questions, checklists and helpful resources built in – it’s like a workbook for your hiring managers! This eBook will be available for free download for a limited time. If you are interested in a print copy, or even bulk copies for your organization, please let me know and we can discuss pricing. Are you ready to share this with the hiring managers in your organization? Simply click on the image to download your free copy! If you enjoy this resource, please share this post with your network. I’d appreciate it! Want to receive phase(two)learning goodness directly to your inbox each week? Simply add your email address in the upper-right corner of this page. You’ll be glad you did! Congratulations on 100 posts Michelle, that’s a great achievement! Congratulations! The ebook will be very helpful. Thank you!